Raw cranberries have moderate levels of vitamin C, dietary fiber and the essential dietary mineral, manganese as well as other essential micro nutrients in minor amounts. The Cranberries are grown and sun dried in Canada. Carefully grown without any pesticide. 100% Organic Certified. Apple juice sweetened. 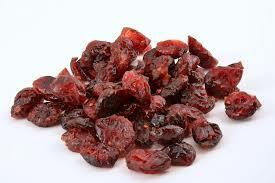 For more information about Cranberries including nutrition facts click here. Available by 500g and 1kg. Select from the drop down menu.